Just a quick announcement that Andrax.Net has added multiple means to allow users easy access to our forums for both new and existing users. Added today are Facebook Connect, Twitter Connect, and OpenID. If you are currently using any of these services you can now register on the forum using this account information. Existing users wishing to convert or add this option to their existing accounts need only follow a few simple steps. This should be a Direct Link to the section to edit your connection details (MUST BE LOGGED IN FIRST), if you experience issues, step by step instructions are included below. New users wishing to register using Twitter Connect of Facebook Connect will see an alert on the right of the Registration page offering the ability to use their Facebook or Twitter details. OpenID can be utilized using the same steps listed above. We hope that our new and existing users will enjoy this new integration and take advantage of single sign-in options to help alleviate having to keep track of 100 different login details across the interwebs. Amazon's Audible.com Blackberry client is now available for download via App World. 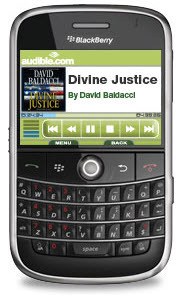 For a limited time, users can download David Baldacci's bestselling thriller Divine Justice, narrated by Ron McLarty. The Audible application provides Blackberry users the ability to shop, download, and listen to over 75,000 titles. That should definitely help to keep you occupied while traveling or between meetings all from the device you're never without. Audible for BB v1.4.2 supports the Tour, Curve, Pearl, and Bold. It can be downloaded here. Today is a big milestone for Unknown Worlds: we've just released the NS2 "Engine Test" to everyone that has pre-ordered the game. This is the first version of the game and game engine that will allow you to run around on a couple small maps and fire the rifle at animated dummy targets. The first time you run it, you'll need to enter your NS2 game key (sent after ordering the game). If you've lost your game key you can retrieve it here (http://www.unknownwo...om/ns2/retrieve). This release will also allow you to load up any map you build and run around it. Finally, enterprising mod-makers will also be able to start hacking around with the game script code that comes with it, although this is not meant as an official mod release. We're looking forward to your feedback (http://tinyurl.com/ns2feedback) and we hope you enjoy this firstlook at the cool technology behind the game! If you haven't gotten your pre-order on, you might want to check this out. Can't wait for the final release of this LONG OVERDUE title. Natural Selection was one of the most engrossing, unique HL mods that I have ever seen. Glad to see they are still alive and kicking. I don't think that we have many members that are in Idaho or the Boise area, but if you are then you should definitely consider stopping by to get registered, it could make the world of difference! If you are a resident of the Treasure Valley already or will be visiting the area the weekend of August 9th please take a few moments and stop by the Boise City Hall on Capital Blvd in the heart of Downtown to register as a Bone Marrow Donor. The process is completely painless to register and also free. Typically the cost to register yourself as a donor is $50 (fifty dollars) but during this one day event that cost will be waived. See press release below. The process is simple, painless and quick. A cheek swab is taken, tested and then entered into the nationwide database. Thousands of patients are waiting for a bone marrow donor match and you could help save a life. Boise’s last locally-sponsored bone marrow donor drive will be held Saturday, August 9, 2008, at the Boise City Hall Plaza from 9am-4pm and will be FREE to the public. Participants wishing to help save a person’s life need only show up and undergo a simple cheek swab to be entered into the National Marrow Donor Program Registry. The event is being sponsored by Saint Alphonsus Cancer Center and St. Luke’s MSTI, the National Donor Marrow Program, Inland Northwest Blood Center, and Group One Real Estate. Saint Alphonsus Marrow Donor Registry closed its doors in April of this year, while St. Luke’s MSTI Marrow Donor Center will end operations in September. The decision to close the donor centers in Idaho was due to new national recruitment quotas and other requirements mandated by the National Marrow Donor Program. The donors recruited by both programs will be transferred to and managed by the Inland Northwest Blood Center in Spokane. The August 9 drive is being held in honor of Shannah Hadley, a young Treasure Valley wife and mother of two girls who was diagnosed with aplastic anemia (a type of blood cancer) just two months ago. There are currently over 6,000 men, women and children across the United States waiting for a bone marrow donor match to save their lives. Bone marrow and stem cell transplants are used to treat leukemia, lymphoma and other life-threatening diseases. For additional information about the August 9th Boise’s Last Bone Marrow Drive please contact Carey Farmer at 724-4062. ANAHEIM, Calif. -- August 3, 2007 -- Blizzard Entertainment, Inc. today announced plans for the second expansion to World of Warcraft®, its award-winning massively multiplayer online role-playing game (MMORPG). Unveiled at the company's BlizzCon™ gaming festival before an audience of more than 8,000 gamers, World of Warcraft: Wrath of the Lich King™ will open the forbidding wasteland of Northrend to exploration by the hardiest adventurers. New levels of power, challenging new dungeons and encounters, an exciting new character profession, and the game's first hero class are just some of the new features awaiting players in Wrath of the Lich King. "This expansion will add some of the most infamous characters and settings from the Warcraft® universe to World of Warcraft," said Mike Morhaime, president and cofounder of Blizzard Entertainment®. "In addition to new story content, Wrath of the Lich King will introduce a number of features specifically requested by players over the past couple of years. We're looking forward to sharing further details with everyone as development progresses." Players last visited Northrend in Warcraft III: The Frozen Throne™, when Arthas Menethil fused with the spirit of Ner'zhul to become the Lich King, one of the most powerful beings in the Warcraft universe. He now broods atop the Frozen Throne deep in Icecrown Citadel, clutching the rune blade Frostmourne and marshaling the undead armies of the Scourge. In Wrath of the Lich King, the forces of the Alliance and the Horde will venture into battle against the Scourge amid Northrend's howling winds and fields of jagged ice. * Death Knight Hero Class: Create a high-level Death Knight character -- the game's first hero class -- once certain challenges have been met. * Increased Level Cap: Advance to level 80 and gain potent new talents and abilities along the way. * Northrend: Explore the harsh new continent of Northrend, packed with new zones, quests, dungeons, monsters, and items -- and do battle with the undead armies of the Lich King. * "Inscription" Profession: Learn this exciting new profession and gain unique ways to permanently enhance spells and abilities in the game. * Siege Weapons and Destructible Buildings: Take the battle to another level with new player-vs.-player game mechanics and new battlefields to wage war on. * New Character Customization: Change how characters look and express themselves, with different hairstyles and dance animations. For all the details and a look at the art/screenshots from this upcoming expansion you can head over to the Lich King website. It took security engineers perhaps less than two hours yesterday to introduce Apple's surprise entry in the field of Windows browsers to the big, cruel world of exploits and vulnerabilities, following its introduction yesterday morning at WWDC. As a result, much of the clout Safari had received as the secure browsing alternative to Internet Explorer and Firefox -- as long as it was on a Macintosh -- was burned off like fire to a flash fuse. 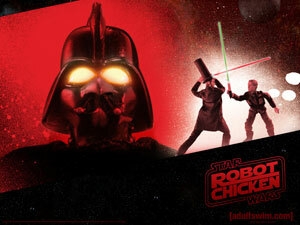 So the guys at Robot Chicken have a 30 minute Star Wars special coming up this Sunday, June 17th at 10:00 PM. It should be outstanding. Check the link above for a selection of trailers, clips, and wallpapers to get you through the rest of the week. For your viewing pleasure, if you have not already seen it, I highly recommend you navigate your browser over to this Google Video. Any Star Wars fan will appreciate it I think. On an un-related note, I just found my way to this Ryan vs Dorkman lightsaber battle. Another good time waster if you have 10 minutes.